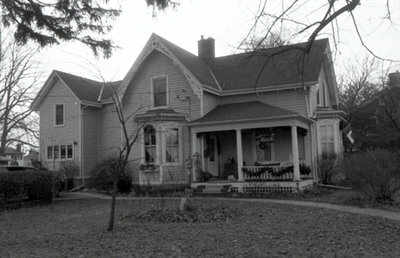 A black and white photograph of 401 Colborne Street. This frame house was built between 1875 and 1880 by Andrew M. Ross (1851-1936) at the south-west corner of King and Colborne Streets (401 Colbourne Street West). Mr. Ross was a dry goods merchant in Whitby and a former mayor of the Town. His daughter, Miss Marcia Ross (1889-1979) was the last of the family to live in the house. Ferencz, Carl ; Ross, Andrew M.
401 Colborne Street, c.2006, Carl Ferencz. Whitby Archives A2013_013_003C.